Sunshine is a rare commodity in the United Kingdom. For the gloomiest, soggiest patrols, British officers trust this Jacket to keep comfort and awareness high. 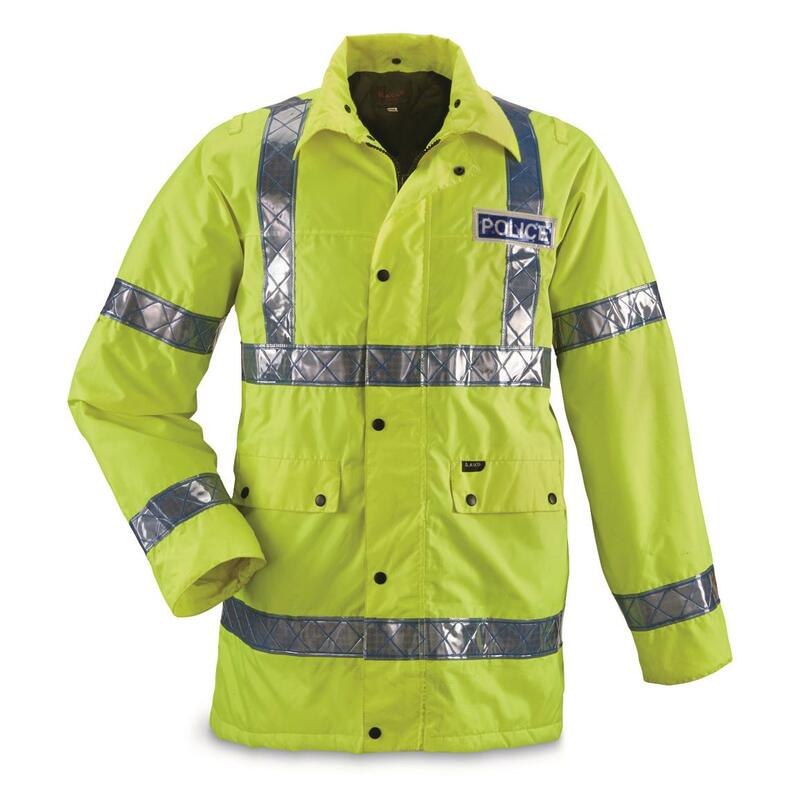 Heavy-duty weatherproofed polyester shell combines with a quilted, insulated liner for welcome defense against wet and cold. High-visibility yellow with reflective silver stripes is easy to see in the thickest London pea-souper. For bad-weather chores, late night emergencies, before-dawn dog walks and more. Here for a low military surplus price! Note: Liners may vary and jackets may or may not state "Police"
Be prepared for stormy weather! Order now! 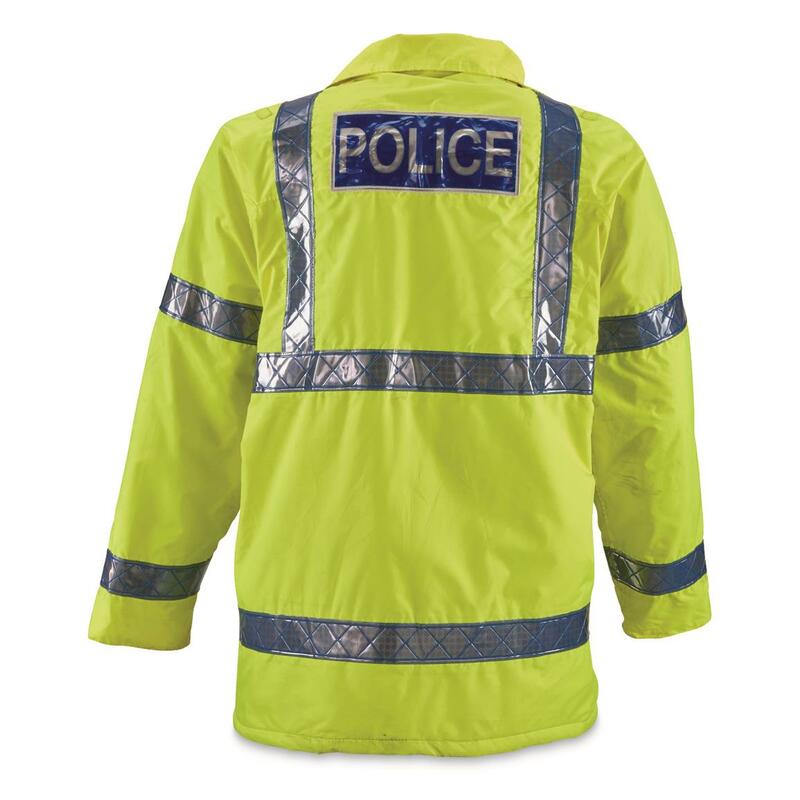 British Police Surplus Rain Jacket, Used is rated 4.0 out of 5 by 1. Rated 4 out of 5 by FrBill from Nice bit from Britain Fits a little large but that's okay I can always add a sweatshirt or hoodie when it gets colder. The reflective tape is really nice and works great! But the one I got the yellow is really faded it is more like a blue grey or someone got a ton of grease on it and it stained it there are no real pockets either. But overall I do like it.